Lucas Keller, Student Body Vice President at Deer Park High School is a member of several clubs including DECA, Key Club, and Link Crew. He is also a well-regarded member of the Varsity Football team and said he has had a passion for football since grade school. He credits the team work of football as a positive effect in his life. He hopes to attend a school with D-3 football and a good Pre-med program. He is looking at the University of Puget Sound and Pacific Lutheran. His goal is to be a pediatrician and make a difference in people’s lives. His father, Eric, is with the Deer Park District of DNR and his mother is a pharmacist. He ended by thanking the club for selecting him as Student of the Month. Riverside High School’s student of the month is Ava West. Ava is the second student in her family to represent Riverside High School. Her sister, Paige, was January Student of the Month in 2017. Ava is taking AP classes and is a tri-sport athlete competing in soccer, basketball and tennis. She said she is blessed with an amazing supportive family at home and a second family at school. Ava said the teachers at Riverside work with students to help them achieve their goals and she feels Ken Russell, the new Superintendent at Riverside, has energized the school. She sees more students at games and more school spirit. Outside of school, Ava is involved in her church youth group. She has traveled to Mexico with them to build houses and spends a week each year in service at Camp Spaulding helping where needed. Ava’s future goal is to be an architect. Jake Everly is Mary Walker’s October student of the month. Jake has one brother who is a sixth grader at Mary Walker, his father is a policeman in Spokane and his mother is a stay at home mom. When introducing Jake, Bob Lockhert told us that Jake is very personable. Jake’s favorite classes are sports and metal shop. He is a member of the varsity football and baseball teams at Mary Walker, as well as involved in leadership activities there. Jake filled us in on all of the activity at school as they get ready for Homecoming. Jake and his family have a family farm and Jake personally takes responsibility for 60 of those acres. He raises cattle and has cut hay and is looking to plant some of it in wheat next year. He plans to go to Spokane Community College, get his CDL which will be very helpful to him in his goal of being a full-time farmer. 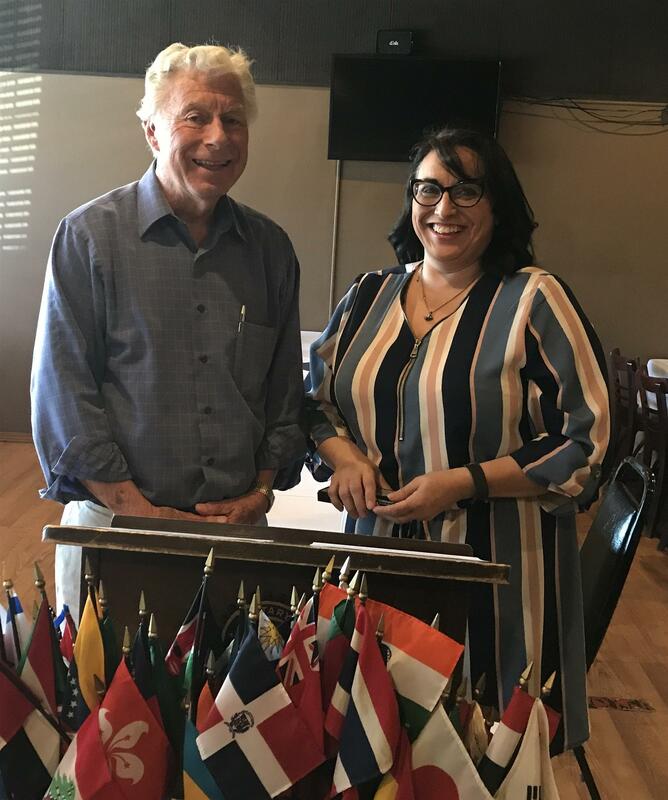 Kristina Ralls, Director of Legal Programs for The Spokane County Bar Association Volunteer Lawyers Program (VLP) was guest speaker at the Deer Park Rotary meeting September 27, 2018. The Volunteer Lawyers Program began in 1985 to provide legal services to low-income residents of Spokane County and outlying counties who may otherwise be denied adequate representation or access to the civil justice system, and to encourage local attorneys to fulfill their duty to provide pro bono services. The program is funded through The Legal Foundation of Washington, interest on trust funds, state and city funds, local grants and donations. If you are low-income, at or below 200% of the Federal Poverty Level, and have a non-criminal legal problem, contact CLEAR (Washington State’s Coordinated Legal Education and Referral System) for accessing legal aid at 1-888-201-1014 Monday through Friday from 9:15am to 12:15pm or visit nwjustice.org/clear-online. There is no income eligibility for Seniors 60 or older and seniors may call CLEAR for Seniors at 1-888-387-7111. The VLP staff consists of an attorney, non-attorneys and volunteers who help with paper work, filling out forms and in the courtroom in matters of family law, landlord-tenant issues, Chapter 7 bankruptcy, consumer matters, wills and estate planning. In addition, they recruit volunteer attorneys to staff clinics and dockets that address these needs held during the week at various times. The VLP is fortunate to have assistance from volunteer paralegals and Gonzaga Law School FLASH Program students. September Students of the Month are from Deer Park and Riverside High Schools. Mary Walker’s Student Body President will be our guest next month along with the October Students of the Month. Braiden Sparkes is Student Body President at Riverside High School. Braiden has a younger brother who is also a student at Riverside, his mother is a teacher in School District 81 and his father is a hunter who has land in Washington, Idaho and Montana. In introducing Braiden, Bob Carroll pointed out that he is a departure from past students who are usually focused on further education. Braiden’s goal is to see if he has a future in hockey. As a junior, he moved to Seattle and lived with a host family where he played on a hockey team. He attended a school with 2500 students and that experience made him appreciate the size of Riverside where he feels at home. Braiden is also on the football team and said he is very competitive and wants to be the best in whatever he does. 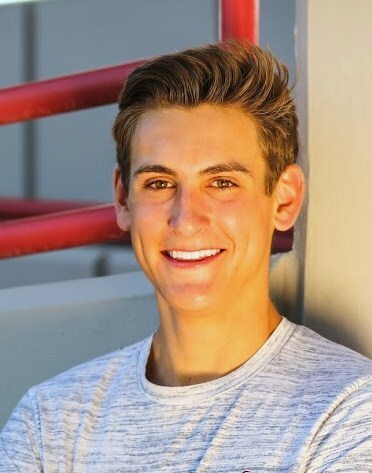 Through his ASB involvement, he tries to involve freshman so that the good student atmosphere at Riverside continues and he wants everyone to feel a part of the school. After high school, he hopes to receive a hockey scholarship, pursue criminology and someday be a member of the FBI. Everett Pierce, was introduced as an outstanding student with intense mental and physical strength by Deer Park HS Principal Joe Fiest. Everett suffered a knee injury while wrestling a year ago and was told it would take a year for him to recover before he could compete in athletics again. He wouldn’t accept that prognosis and was back in sports after 3 ½ months. He said didn’t want to accept failure and wants to be the best he can. Along with football, wrestling and ASB, Everett is a member of Key Club and Link Crew. He wants to give back to the school and says that helping someone makes your day better. Everett also introduced his father Aaron, an employee at the Deer Park Post Office for many years and his mother, Jennifer who works at Acceptance Captital Mortgage in Spokane. Outside of school, Everett likes to hang out with friends and family. He has candidate status with the US Naval Academy where he hopes to attend and eventually become an officer in the Marine Corp. Everett concluded in thanking the club for selecting him as Student of the Month. Melanie Allen was the guest speaker at our August 30th meeting. Melanie began by thanking us for the recent $500 donation and said the timing of the gift was perfect as there are no grants available in the summer but the need is still great. She told us that The Greenhouse Community Center has grown from its first beginnings as a small food bank and clothes closet at Zion Lutheran Church in 1987 to a place that provides a food bank, clothing bank, emergency services, furniture, household and miscellaneous items for people in the Deer Park area. The only qualification to receive food from the food bank is to be a resident of Deer Park. Each month eligible residents are able to select food from the pantry’s shelves and fresh produce once a week that has been “rescued” from five local grocery stores in north Spokane County by Greenhouse volunteers. Between the monthly and weekly visits, the Greenhouse serves approximately 250 families with 1200 visits per month. The Greenhouse is supported by County Block Grants, Second Harvest, thrift store purchases and donations from churches and organizations. When asked “When do you need volunteers?” Melanie replied they’re always happy to have volunteers and they’ll find something for you to do. Assistant Governor John Guarisco introduced our 2018-2019 District Governor Bev Reed. Bev, a member of the Rotary Club of Spokane Aurora Northwest has served as President and was the club’s Rotarian of the year in 2005 and 2015. Bev has also been engaged in the District as a facilitator for the Rotary Leadership Institute, a President Elect Training Seminar instructor and has been selected to be the PETS OPCOM Chair in 2021. Bev is a Major Donor and belongs to the Paul Harris Society. She recently retired after a 38 year career with the YMCA. DG Bev began the meeting by sharing RI President Barry Rassin’s theme “Be the Inspiration” and her question “Why are you here?” As she meets with members of each club board in the district, she asks them to select a picture card that speaks to their passion and explain why. Three of the stories she shared highlighted the eradication of polio in the world, the building of communities at home and in the world and the education of children. She encourages each of us to use our passion to “Be the Inspiration”. DG Bev played a video promoting Rotary District 5080’s 2019 Conference “Come Together”. It is the first joint conference with Seattle’s District 5030 and will be held in Spokane on May 16-19, 2019. There will be golfing, wine tasting, a “hands on project” and keynote speakers Angelo Lombardo, Minda Dentler, Rotary International President Barry Rassin and Bill Gates. Bev led us as we enthusiastically sang1 the Rotary version of “Come Together” by the Beatles. Mark your calendar; this will be a great conference! PDG Bob Carroll talked about how Rotary changes a little bit every year. Some of these changes come about due to a change in the complexion of membership. He spoke about the “dirty hands” projects done by the Deer Park Rotarians through the years. As the years passed, it became apparent that physical labor was becoming more difficult and the club reassessed how they could continue to serve the community and focused on supporting youth with programs like student of the month, scholarships, Interact, literacy and scouting. As he introduced Aaron Norris and Darci Mankin he wondered how their interests and skill sets will impact the club. We don’t know what those changes will be but we know they will enhance Rotary’s ability to deliver meaningful change in our community and the world. When offering a few words, Aaron said that his vocation is banking but his life work is “Service” which is apparent as he is an Eagle Scout. Darci’s vocation is also in banking but her degree is in education and she sees her service as working with youth in any way. It is a pleasure to welcome these two impressive individuals to join us in Service Above Self. Don Veillette and his wife, Marge, were special guests at the July 19th Deer Park Rotary Club meeting as the club recognized Don as a lifetime honorary member. Don, along with twenty other business and professional leaders of Deer Park became the chartered members of the 259th club to join Rotary International, an international service club whose motto is “Service Above Self”. Through the many years of Don’s time in the club, much was accomplished by the Rotarians for the Deer Park Community. Some of the projects included installation of the sprinkler system at Perrins Field, helped construct the bleachers at DPHS football field, constructed the dugouts at DPHS and helped financially with the reconstruction of the dugouts, along with providing scholarships at Deer Park, Riverside and Mary Walker High Schools and sponsored Deer Park Cub Scout Pack #202. Don served as club president twice and was the club historian. As he shared memories of the club and individual projects he made that are still used in the meetings, he also shared how deeply he cares about Rotary and how it has made a difference. Thank you, Don, for your service through the years in Deer Park and in the world. Jeremy recognized one of our newest members, Casey Armstrong, as Rotarian of the month of May. Before Casey was even inducted into the club, she led the club in flower sales. She not only pre-sold 22 baskets in less than a week, she got them from the greenhouse and delivered all but those who wanted to pick them up. Since joining the club, she has supported all of our projects and events. Our guest speaker was Mike Bucy, Fire Chief at Stevens County Fire Protection District #1 and fellow Deer Park Rotarian. District #1 serves Southern Stevens County and covers communities of Clayton, Deer Lake, Ford, Loon Lake, Suncrest, Tum Tum, Williams Valley and Springdale. It is staffed by a combination of paid and volunteer personnel. They responded to 1400 calls last year, up from 1100 in 2013; 70% a result of medical/trauma accidents with a majority being ATV accidents. They partner with Life Flight and are helped by “Tender Operators”, volunteers who take vitals, drive water tanks and free up regular firefighters. The district is largely rural-wildland that includes private forestland. Chief Bucy is very proud of a special wildland truck that they built themselves at a fraction of the cost to buy one like it new and the new Fire Stations at Loon Lake and Suncrest. Along with their duties on the job, they work with kids, train military and provide other community services. Mike finished up by answering questions and giving us all important advice on how to protect our homes and communities from fires. Washington State Attorney General Bob Ferguson was our guest speaker. He is a 4th generation Washingtonian whose family has deep ties in Everett, Washington. He began his legal career in Spokane and later returned to Seattle. He was elected as the 18th Attorney General of Washington State in 2012. He told us that our club is the 126th Rotary Club in Washington that he has visited. 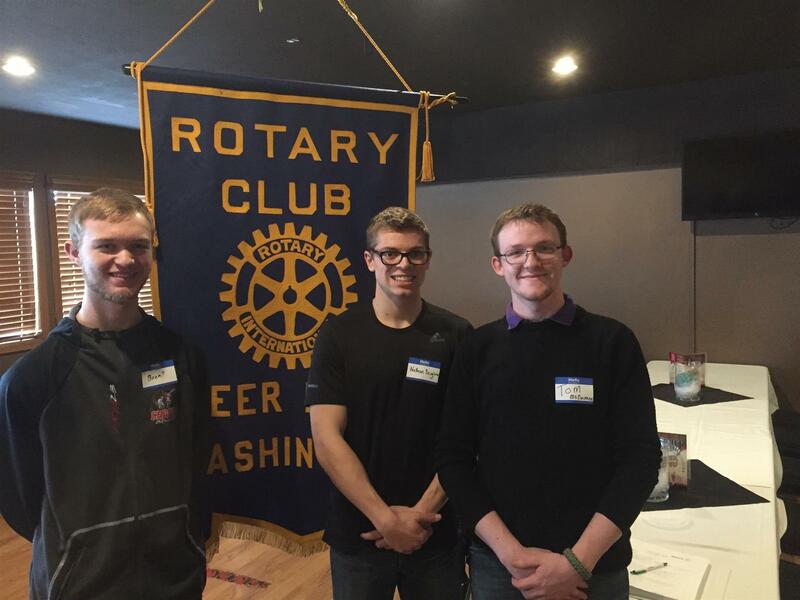 He was at the Colville Rotary Club yesterday and started today at the 7:00 am Kettle Falls Rotary Club. He learned early on that Rotary Clubs share the Attorney General office’s mission of service to the community. The AG’s office is the largest in the state, employing over 1000 with approximately 600 Attorneys and 600 professional staff. The AGs office researches and gives legal advice and available options, but does not set policy. It works on behalf of the people of Washington through civil and consumer protections and defends Washington State law. When asked what had he learned from the transition of attorney to Attorney General, he said it wasn’t so much learned but the realization of managing a department of over 1000 people and the breadth of the responsibility of the Office. He ended by thanking us for having him and for letting him move his time up a bit in order to make a 3:00pm flight so he could have dinner with his wife and 10 year old twins. I think everyone present would agree that it was an honor and pleasure to meet Attorney General Ferguson. May 20, 2018 was our Annual Student of the Month Banquet held at St Mary Presentation Catholic Church in Deer Park. Twenty-four students from Deer Park, Riverside and Mary Walker High Schools, along with their parents were invited to an evening of fun, food and fellowship where they were recognized with certificates and gifts. Our Student of the Month Program and the annual banquet has become one of our favorite events. This program, along with Academic/Leadership and Vocational scholarships, monetary donations to local food banks, RYLA scholarships and community projects like the playground equipment in Mix Park are possible through the generous support of our Golf Tournament, Flower Basket Sales and Holiday Sign. 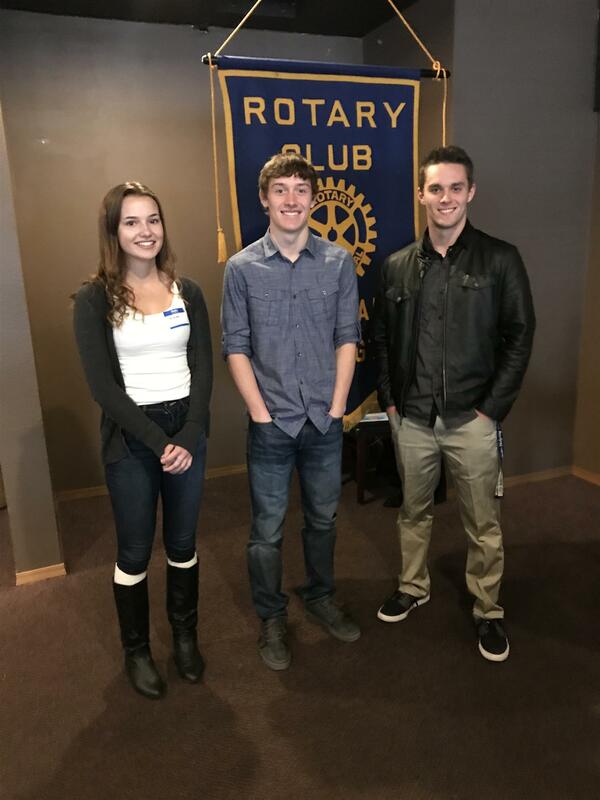 Congratulations to Mary Walker's Brent Fiola; Deer Park's Nathan Berglund and Riverside's Tom McNamme who were selected as Deer Park Rotary's March Students of the Month. Brent, Nathan and Tom told us about their classes, sports and updated us on the happenings at their respective schools. All three students were impressive presenters and high achievers. Each year Deer Park Rotarians look forward to a visit from the Clayton Community Fair Royalty and their adviser Karen Martino. In their promotion of the fair, we learn about its history, the events and opportunities available and any current information. 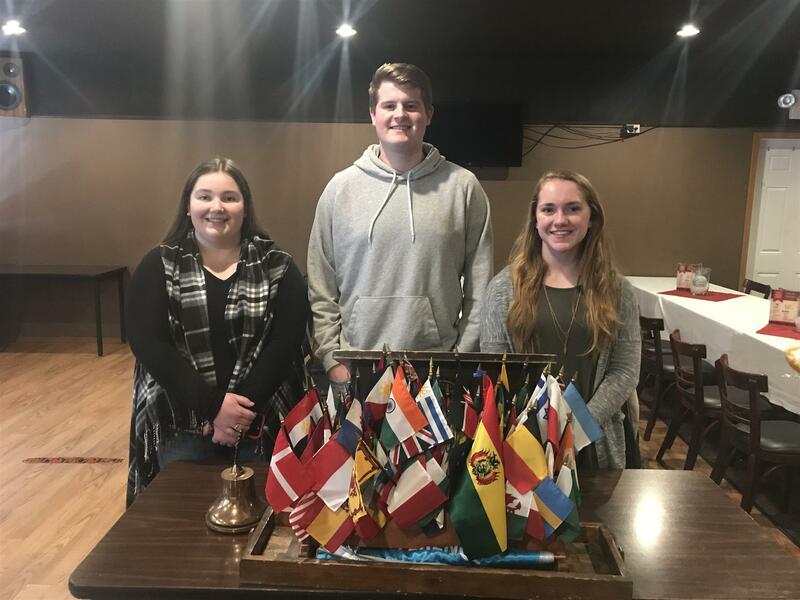 This year was no exception and President Jeremy Marcuson was happy to present a check in the amount of $100 to Queen Karli Kastener and Princess Hannah Moore. This year’s Fair date is August 24 through August 27. Courtney Stockman is student of the month from Deer Park High School. Courtney’s love of horses and riding comes from past generations of her family. She and her mother enjoy riding together. Courtney has been involved in Link Crew and softball for several years. She has been in band since the 4th grade and is currently in the Deer Park HS band and will be going to Anaheim with the group. She is also a member of FFA and raises hogs. Courtney plans to pursue pre-med at Spokane Community College following graduation. 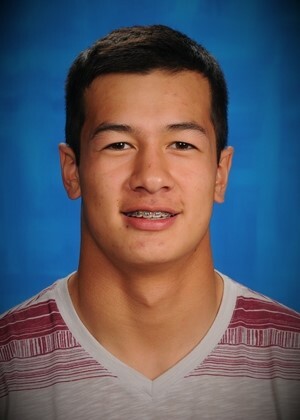 Riverside High School’s Deakon Franks is student of the month. Deakon has attended Riverside schools for 13 years. He has been involved in baseball, basketball, cross country and wrestling. His favorite sport is wrestling. Deakon is also completing his first year in Running Start and will be going to Washington State University this fall. Along with his academic courses, Deakon enjoys learning and working with the strength of carbon fiber and its ability to replace aluminum. Cameron Franks has lived in the Valley-Springdale area all of his life. He attended Valley elementary school and is a senior at Mary Walker High School. Cameron has been a member of the basketball team for three years and said it’s his favorite sport. He feels the challenges and struggles he encounters in basketball help him in his daily life. He plans to work with his father after graduation. President Jeremy presented a $100 gift from the Deer Park Rotary Club to Hospice of Spokane . Accepting the gift is Joan Poirier, Director of Development and Communication. Hospice of Spokane is Washington's only nonprofit hospice serving Spokane, Ferry, Stevens and Pend Oreille counties. They provide a holistic approach to end-of-life care addressing medical, emotional, psychological and spiritual needs of patients with terminal illness and their families. Haylee Swiger has lived in the Springdale area all of her life. She is Vice President of ASB and a member of the volleyball and softball teams. During fall and winter, she is a cheerleader for the football and basketball teams. Haylee, along with Mary Walker students, collected canned food and raised money for the Loon Lake Food Bank by holding a movie night and selling sno-cones. Haylee plans on attending Eastern Oregon University where she will pursue a future in social work. Olivia Willis began by thanking Rotary for selecting her as Student of the Month from Riverside HS. Olivia has maintained a 4.0 GPA in HS and is currently enrolled in 10 classes. She will be a 12 sport varsity athlete, lettering in cross country, basketball and track each year and is a musician. She plays acoustic bass in Riverside’s jazz band, electric bass in the pep and marching bands and flute in the concert band. Olivia is ASB executive treasurer, senior class treasurer, and president of the Riverside Honor Society, band and French clubs. She volunteers at the local animal shelter, Spokanimal, tutors students, gives music lessons and is an employee at the Ram Drive In. Most importantly she is a dreamer who, at a young age, dreamed that she will make a difference in the world. Olivia plans on studying behavioural neuroscience at either Stanford University, the University of San Diego or the University of Washington with the dream of helping individuals overcome mental disorders. Deer Park High School’s Mikal Palmer is ASB Sergeant at Arms. He is involved in leadership and is a member of Link Crew, helping incoming freshmen during their first year at Deer Park High School. Mikal plays basketball, football and golf and recently learned he has been selected for the All State 2nd team in football. He recently attained his goal as an Eagle Scout. He is currently taking Real Estate classes, is a member of the Latter Day Saints and will go on a mission in a year or so. Guest Speaker Mary McDermid, Mass Mutual Life Insurance Company's "Special Needs Trust" Specialist drew the lucky winners of our 2017 Santa's Helper Raffle. First prize of $1000 went to Gary Webb and $500 second prize winner was Portland Rotarian Randy Barcalow. Natasha Chrisp, a 12 year student at Riverside High School is on the cross country, basketball and track teams. Her classes include Spanish 4 and Calculus. Natasha was in a select group of nationwide students who competed and won a trip to Peru. Lasting friendships were made as they traveled the entire country of Peru in one week. She said that week was the best experience of her life. Deer Park High School student Malia Fay was introduced by President Jeremy. Jeremy noted that not only is Malia an honor student, she has a kind heart and is an excellent employee who works in the office at Vision Source. Malia is president of Key Club, an ASB officer, a member of FFA and has been a member of Link Crew for 4 years. She is very involved in her church and her favorite class is a floral class where she discovered a creative side of herself she didn’t know existed. Enoch Clemmer, a new student at Mary Walker High School transferred this year from Paideia High School in Valley, Washington. Enoch’s favorite class is PE. He loves all sports and has since he was a little kid. He plays basketball, baseball, football and runs cross country. His hope is to be accepted into ROTC at Central Washington University where he can pursue a career as a pilot. Pictured along with our students of the month are Deer Park Rotarians; Deer Park High School Principal Joe Feist, Deer Park School District Superintendent Travis Hanson and Riverside School District Superintendent Ken Russell. 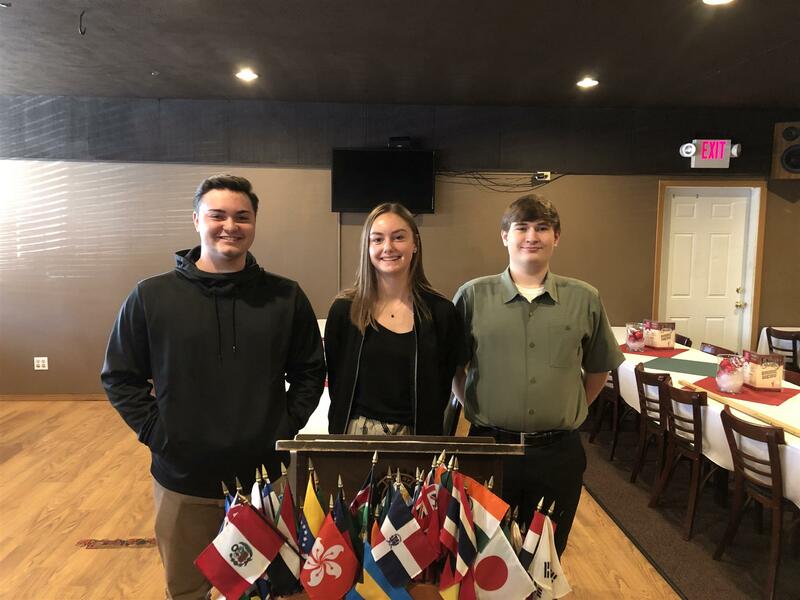 Mary Walker High School student Shandel Swiger, Riverside High School student Ethan Spencer and Deer Park Student Weston Dean were recognized at the November 2nd Rotary Meeting as November Students of the Month. Congratulations to these young people, leaders of the future. District Governor Jerri Anderson was our special guest speaker at the October 26, 2017 Rotary meeting of the Deer Park Rotary Club. DG Jerri shared her personal story of becoming a Rotarian and carried a message of possible initiatives from Rotary International President Ian Riseley. There are a lot of exciting things happening in District 5080 and as DG Jerri says "our future is so bright, we have to wear shades!". She invited everyone to the District 5080 Conference to be held in Sandpoint, Idaho on June 1 through June 3, 2017. There will be world-class speakers, events and fun activities for families and members of all ages. Mark your calendar!! Congratulations Wes Player! Wes became a member of the Deer Park Rotary Club on May 18, 2017 and was recently selected by President Jeremy Marcuson as the Rotarian of the Month of July. Wes is definitely on the fast track and has stepped up to serve in so many areas of Rotary. We are so proud to call him our fellow Rotarian! Riverside's September Student of the Month is Ben Shaw. Ben is Student Body President and is a 12 year student. He is a cross country runner and placed second in the state. Ben ran for ASB treasuer as a 7th grader and has been involved in ASB ever since. He's very proud of the student body and the work they do with their annual Thanksgiving dinner for the community as well as the great Veteran's Day event each year with guest speakers. He likes the small size of the school which allows him to know everyone either by name or by face. Mary Walker's Student Body President is Charlotte Edwards and the September Student of the Month. Charlotte and her family moved from Texas to the Spokane area when her father, an Air National Guardsman, was transferred to Fairchild Air Force Base. She also serves as the senior class president and an Honor Society member. Charlotte's mother is a nurse and Charlotte wants to be a doctor. She hopes to attend Washington State University or the University of Southern California after graduation. Payton Erickson, Deer Park plays softball and volleyball and is a member of Link Crew. Her English and History classes are through EWU and she hopes to go to be a pediatric nurse. Evan Kitt, Mary Walker has AP classes in literature, Spanish and Pre-calculus and is in Upward Bound. He plays football and basketball but his favorite class is weight lifting. Jamie Connor, Riverside is a 12 year student at Riverside. She is a member of Honor Society, varsity soccer and track. Her favorite subject is math and she hopes to attend WSU with a future as a chemical engineer or something in the math field. Bonnie is an Independent Medicare Insurance Broker for Lifeline Insurance who represents Aflac, Medicare Plans, Individual Health, Life and Disability, Annuities, Long-Term Care, Identity Theft Protection, Pre-arranged Final Expenses and Washington Health Benefit Exchange-ACA. She has attended many Rotary clubs throughout the years and found our club to be “very welcoming” and wanted to join. She has lived all of the country and came to Spokane in 1980. She graduated from EWU in 1983 and spent 30 years in advertising. Due to a horrible medical trauma affecting her husband, she left advertising and began her career in insurance needs. She finds the work very satisfying and said “I love helping people!” Bonnie has served in many leadership roles of non-profit groups, has board experience and strong fundraising experience. Although Bonnie lives and has an office in north Spokane, she has spent many years in advertising in the Deer Park area and loves this community. Bonnie is married and has 3 sons. She loves one on one conversations and hopes to get to know many of us personally. Transitions teacher at Riverside High School, Rachae Allert, and four of her students were our guest speakers June 8, 2017. The Transitions program is in its fourth year at Riverside and connects students with intellectual disabilities and local businesses for on-the-job-training. Students are able to do basic tasks at local stores, restaurants, hair salons and boutiques. Students spend close to two hours a day, four days a week voluntarily working at several businesses in the area. Rachae introduced each of her students, Logan, Sianna, Christain and Tatiana as they told us of their work experiences and accomplishments. We were all moved by the student’s commitment and desire to become a valuable part of society. “We’ve found job training is critical to their high school success, because these kids might not be our college-bound kids, but truly eager to work, eager to learn, they’re eager to be contributing members of society. They want to be there. They want to help. They want to be in your community” said Allert. Thank you to local businesses and staff at Riverside HS who make this program possible. Wes Player was inducted as a new Rotarian by Past District Governor Bob Carroll at the May 18th weekly Rotary meeting. Wes is a retired educator who taught chemistry and physics, along with coaching cross country at Mead High School for 34 years. Wes continued to coach at Deer Park High School after retirement. Prior to his induction, Wes has been a regular at the weekly meetings and served with the Rotary club last year as they provided crowd control during the Settlers Day parade. 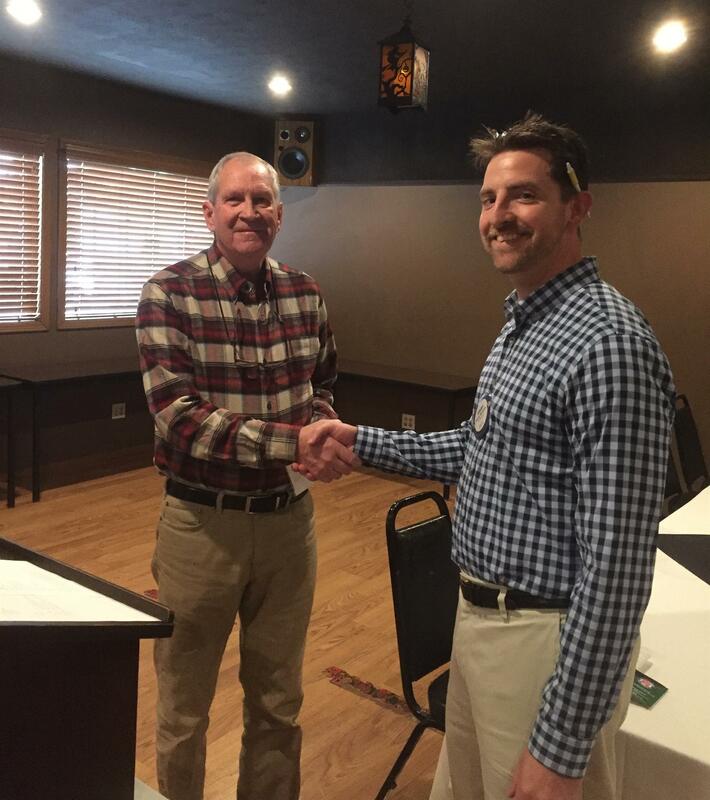 Scott Breneman is the newest member of the Deer Park Rotary Club having been inducted May 25th. Scott is originally from Ohio and his career has taken him to Florida, California and, most recently, one and a half years ago, to Deer Park. Scott is a structural engineer who has also worked at a California soft ware company. He currently works with engineers and architects as a consultant whose buildings are constructed entirely with wood from local lumber companies. Deer Park Rotarians welcome Wes and Scott as we serve together in our community and in the world. Each year the Deer Park Rotary Club holds a Student of the Month Banquet. Twenty-four students from Deer Park, Riverside and Mary Walker High Schools, along with their parents, siblings and other family members are invited to an afternoon of food, fun, prizes and recognition. This year's event was held in the pavilion at the RV park in Deer Park Sunday, May 21, 2017. Each student received a Certificate in recognition of outstanding achievement in scholastic, citizenship and school and community service along with a gift from the Deer Park Rotary. Congratulations to these young people who have completed a significant chapter in their lives. Elizabeth Burns, senior at Riverside High School is a member of the Honor Society and WDFY. Her sports include basketball, soccer and cheerleading. Elizabeth plans to attend Eastern Washington University where she will pursue a career in nursing. Deer Park student Riley Wilson is a senior and cross country state champion. Riley’s participation in sports include basketball and track. He is a member of ASB, Key Club and DECA. Riley is looking at business or sports management and is still deciding whether he will go to Western Washington University or spend the first 2 years at Spokane Falls Community College. Mary Walker Student of the Month, Tiffany Cochran, was unable to attend today’s Rotary meeting due to a softball tournament but will hopefully be able to attend Deer Park Rotary’s Student of the Month Banquet to be held May 21, 2017.